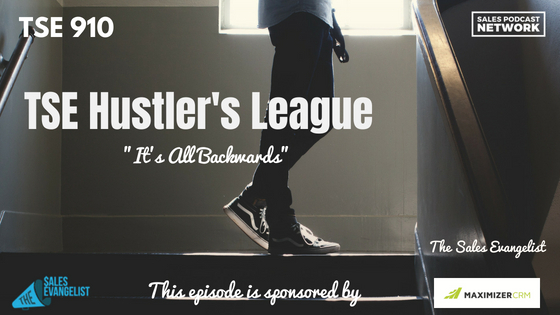 TSE 910: TSE Hustler's League-"It's All Backward"
If you find yourself thinking that your clients just don’t get it, the problem may not be the prospect. It may not even be the product. The problem may be the way you and your company are selling your product. If your sales process is designed all around you, that means your prospects aren’t being considered. Your sales process is backward. 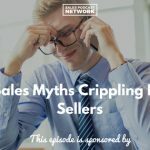 On today’s episode of The Sales Evangelist Hustler’s League, we’ll discuss the signs that your sales process is backward, and what you can do about it. If your prospects don’t have a chance to share how they are buying or to have their own inputs, they may be confused because you didn’t take time to learn from them. Even if you think you listened, I’m going to show you in this episode how we’re not listening. Selling involves much more than just listening to the prospect, which of course you have to do. Our new semester of TSE Hustler’s League will begin in the fall, and we’re going to address business development. We’re going to show you how you can find more prospects and how you can court them. But we’re also going to do something radically different. We’re changing up the curriculum from what we’ve had in the past. Some things will be the same, but one of the foundational ways we prospect will change. We’re overhauling because we have been getting it wrong. Before you skip to another episode, answer this question: In your buying process right now, what does your CRM say? What is outlined? Propose a presentation or demo. That’s the process we’ve taught for a long time, and though it’s good, it’s not great. We’re going to take good and make it great. Flip a switch. We’re going to change from only looking at you. I can’t take credit for this. My good friend Kevin F. Davis taught me this, and I recommend his book, The Sales Manager’s Guide to Greatness: Ten Essential Strategies for Leading Your Team to the Top. These are actionable things that the sales reps are doing rather than actionable steps that the buyer is doing. When it comes to prospecting, you’re looking for customers. It’s a one-sided effort. When a problem emerges on your sales team, you’re addressing it from the standpoint of the seller, after the problem has occurred. Did the seller make enough calls? Did the seller send enough emails? Did the seller do enough outreach? Those are good things to measure, but we should tweak them to focus on our buyers. For example, what is the buyer doing at this point in the process? Is he researching? Is he analyzing? How can we focus more on what the buyer is doing? Is your buyer responding to some existing discontent? If so, do you use content that addresses his discontent in your outreach? In last week’s example of selling chairs, how do you know that your prospect needs to change at this time? How does the prospect know that he needs to change at this time? Is he currently discontent with the chairs he has? You must create pieces of content that educate your buyer about solutions to his discontent. The goal is to get him to agree to an appointment. Give your sellers the foresight, the knowledge, and the tools to help your prospect make a decision. Maybe instead of discovery, you get your prospects to share information about their problems or their needs. You want the prospect to be part of the process. How can your sales team help your prospects share information? Instead of sitting down with your sales rep to figure out whether she made enough cold calls or sent enough emails, role play and focus on the buyer. Figure out how you can get the prospect to agree to more appointments with you. This is how you align sales and marketing. If we have a holistic plan about recognizing what we need to address for our buyers, we’ll tackle it with our workshops, our webinars, and our podcast episodes. Everything we do will focus on the different stages. That effort will guide the prospect, and because we’re focused on the prospect, we’ll guide him through every step of the buyer’s journey. When you move the buyer to the demonstration, you won’t think of it as you giving him a demo. Instead, think of it as him attending a demo. It’s tailored to him. Allow your buyer to share concerns. Personally, I like to do this early in the process, so maybe around the discovery portion where he is sharing his challenges. If I can help overcome the fears, it will make my presentation easier. Once you’ve addressed the challenges and agreed to the terms, he’ll commit to you. Once he does, you want to address expectations. Did you deliver results? Is the buyer seeing an improvement as a result of your product? Once he is satisfied, he has come full circle, and he will refer you to others. I want you to win because if you win, I win in the long run. In the long run, you’re going to tell your friends about the podcast. Your friends are going to tell other people. They’re going to leave a rating and review. Our show is going to grow. Some of them are going to come onto the website. They’re going to see our content. They’re going to see the information. They’re going to say, Donald, I want you to come and train our team. It’s going to happen, so I am here to help you. I am here to help you find more ideal customers. I want you to build stronger value. I want you to close more deals, but beyond all of that, I want to challenge you every single day to go out and do big things. 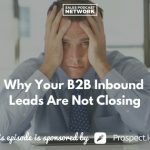 This episode is brought to you in part by Maximizer CRM, personalized CRM that gives you the confidence to improve your business and increase sales. Click on the link to get a free demo of what Maximizer CRM can do for you. This episode is also brought to you in part by Video Jungle podcast. Learn the ins and outs of the video industry and how it can help you stand out from your competition. To listen to the Video Jungle podcast go to wherever you enjoy your shows and search video jungle.